Setting environment variables in your container instances allows you to provide dynamic configuration of the application or script run by the container. This is similar to the --env command-line argument to docker run. To set environment variables in a container, specify them when you create a container instance. This article shows examples of setting environment variables when you start a container with the Azure CLI, Azure PowerShell, and the Azure portal. NumWords: The number of words sent to STDOUT. MinLength: The minimum number of characters in a word for it to be counted. A higher number ignores common words like "of" and "the." If you need to pass secrets as environment variables, Azure Container Instances supports secure values for both Windows and Linux containers. Once both containers' state shows as Terminated (use az container show to check state), display their logs with az container logs to see the output. The output of the containers show how you've modified the second container's script behavior by setting environment variables. Setting environment variables in PowerShell is similar to the CLI, but uses the -EnvironmentVariable command-line argument. Once both containers' state is Terminated (use Get-AzContainerInstanceLog to check state), pull their logs with the Get-AzContainerInstanceLog command. The output for each container shows how you've modified the script run by the container by setting environment variables. 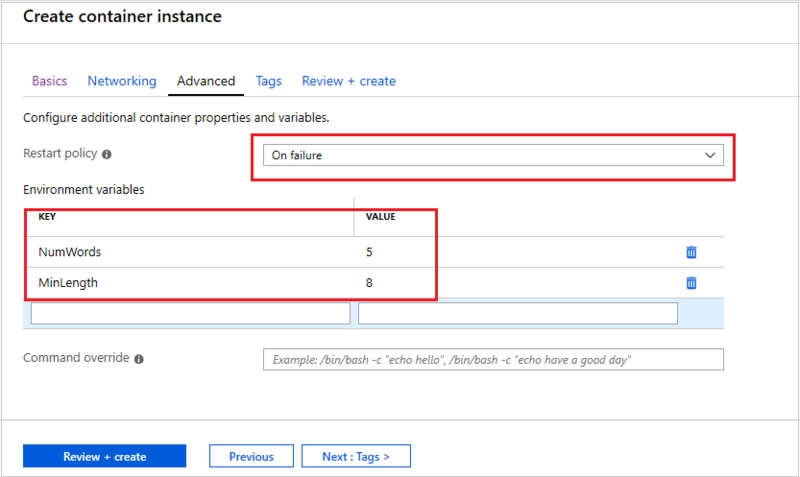 To set environment variables when you start a container in the Azure portal, specify them in the Advanced page when you create the container. Under Environment variables, enter NumWords with a value of 5 for the first variable, and enter MinLength with a value of 8 for the second variable. Select Review + create to verify and then deploy the container. To view the container's logs, under Settings select Containers, then Logs. Similar to the output shown in the previous CLI and PowerShell sections, you can see how the script's behavior has been modified by the environment variables. Only five words are displayed, each with a minimum length of eight characters. Objects with secure values are intended to hold sensitive information like passwords or keys for your application. Using secure values for environment variables is both safer and more flexible than including it in your container's image. Another option is to use secret volumes, described in Mount a secret volume in Azure Container Instances. Environment variables with secure values aren't visible in your container's properties--their values can be accessed only from within the container. For example, container properties viewed in the Azure portal or Azure CLI display only a secure variable's name, not its value. Set a secure environment variable by specifying the secureValue property instead of the regular value for the variable's type. The two variables defined in the following YAML demonstrate the two variable types. Create a secure-env.yaml file with the following snippet. az container exec --resource-group myResourceGroup --name securetest --exec-command "/bin/bash"
Task-based scenarios, such as batch processing a large dataset with several containers, can benefit from custom environment variables at runtime. For more information about running task-based containers, see Run containerized tasks with restart policies.